The window pane in the upper left zone of the UI (shown above) is the input preview. Open an Input File( )to get started. You will see a preview of the text in your document in a uniform font with all images removed. The features associated with this view can change depending on the Mode selected in the Options pane and the type of document. If you have created more than one template, the tabs at the top allow you to switch between templates. Every project should have a detailed template to generate output records. Note: If an input column contains a lot of data, you can scroll the view to the right to see the next column. Select a line of detail data and right click to get started. Adjust the properties of the detailed template and input fields until all the records you want and only the records you want are shown. To search the data displayed in the input view press CTRL+F and a search dialog will appear. You can cut and paste literal text to create a field mask (to include or exclude records) or use regular expressions. To load an input file, click the load Input button ( ). After an input file is loaded, TextConverter applies record and field delimiters preparing a tabular representation or input table view of the original text which is shown in the left part of the Input pane. To view/browse the input file in its original form, click the icon icon associated with your input file. The icon appears to the right of the load Input button ( ). to view the original text file. Unlike the tabular columns in the output preview, the columns in the input view are not re-sizable. Note: If an input column contains a great deal of data, it may be necessary to scroll the input view window to the right to see the next column. To search the data displayed in the input view press CTRL-F and a search dialog will appear. A list of automatically generated input fields (the right part of the pane above) is called the Input Dictionary and will be used as a resource for further data manipulation. Input field names can be retrieved from the input text. To do that, make sure that the option Get field names from the line # is set to 1. TextConverter can work with all the data types encountered in a text document. Blob Hexadecimal encoding of binary data "00ff22aa1133bb88cc..."
The left part of the input section contains Template View and Parsing View tabs. 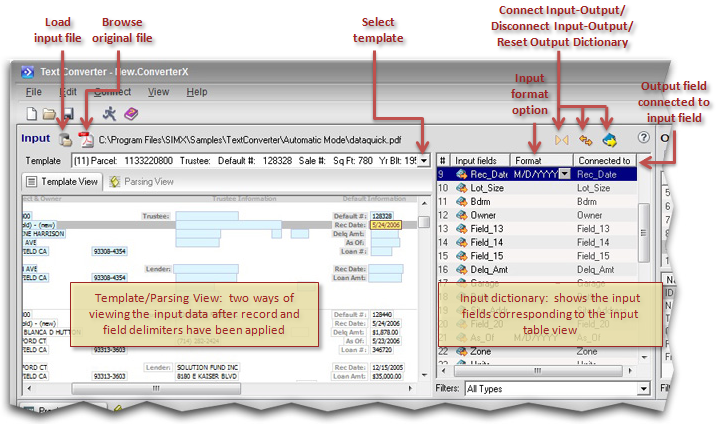 Template View displays an interactive version of the original input document after field delimiters, record delimiters, and records to skip have been applied. 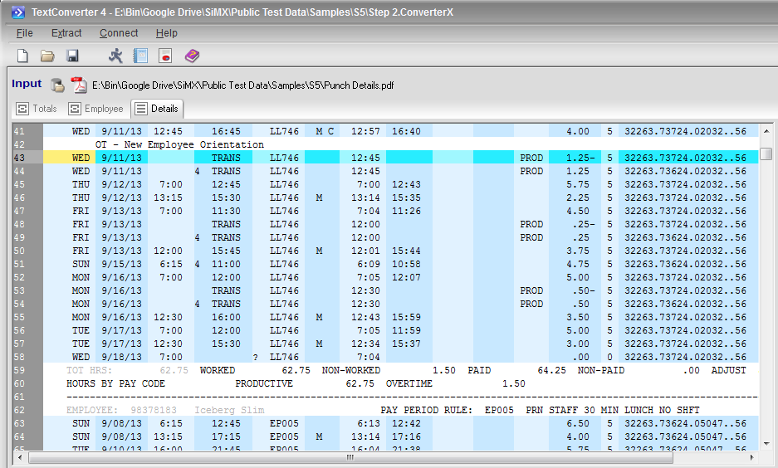 In Parsing View, the information is presented in a set of columns and rows. This approach greatly increases the transparency while facilitating control over the text conversion procedure. 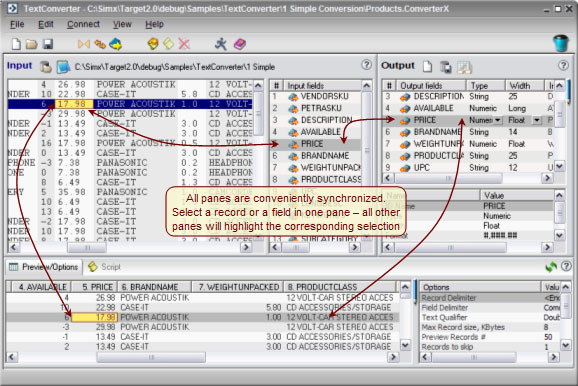 All TextConverter panes are synchronized. When you select (click with a mouse on) a cell in the tabular text pane, an associated input field is selected in the input dictionary, an output field is selected in the output dictionary (see output) and, finally, a corresponding record is selected in the preview pane. This visual sequence allows you to see how each particular input value will look after the conversion. The items selected with a yellow highlight correspond to the elements in the input and output dictionaries. When you do not want to convert some particular input fields, you can remove their input-output connection (see connect input to output). The selected cell's background in the tabular text pane has a different color in this case, only tabular view <-> input dictionary and output dictionary <-> preview are synchronized (no input-output synchronization). The tabular view below delivers additional convenience while working with positional input. The character position is shown under the mouse cursor when you keep it still for more than a half a second. The Input fields are elements of the input record and are displayed in the input dictionary. The input dictionary gives an ability to adjust the conversion settings and control access to the input fields from scripts. You can modify the conversion procedure for a particular input text element (input field) by changing its format, connecting it to or disconnection it from an output field and through scripting. Data types are recognized automatically by TextConverter and are used to initialize the automatically generated input and output field types. Sometimes there is not enough information for automatic data type recognition. For example, a date can be encoded into a text field as [01/Feb/1999:04:58:26]. For such cases, the format of the corresponding input field (Format column of the input dictionary) can be modified to use a custom mask: [DD/MMM/YYYY:H:m:s]. As a result, the date will be read in as 01/02/1999 04:58:26 AM. See output to learn how to change data types for output and input fields. Refer to date and numeric formats to learn how to manipulate text formats. TextConverter4 includes a new Input Field Properties Pane that allows you to more easily control your input fields. Here, you can change the name, type, and other properties. Some new properties include "Can be Empty," and "Exclude," which creates a regular expression that is excluded from the input. More information can be found here.